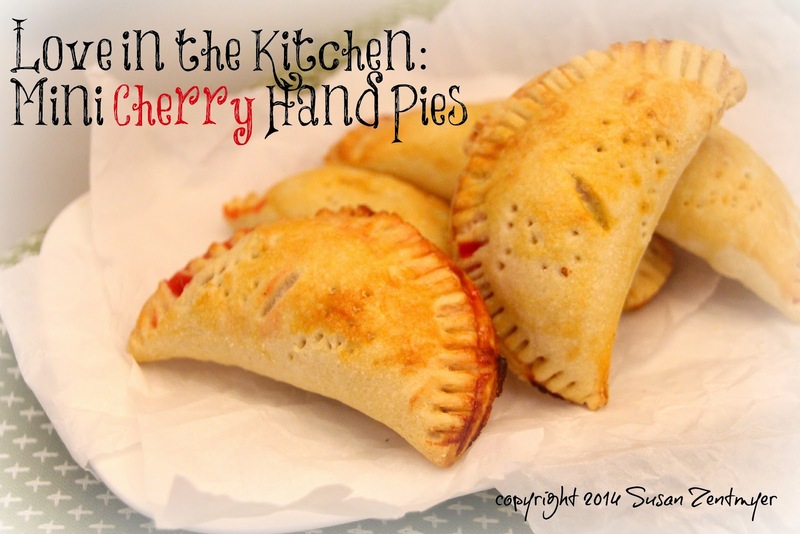 You won't need a fork for these Mini Cherry Hand Pies. And you won't get any complaints that the servings weren't the same size. 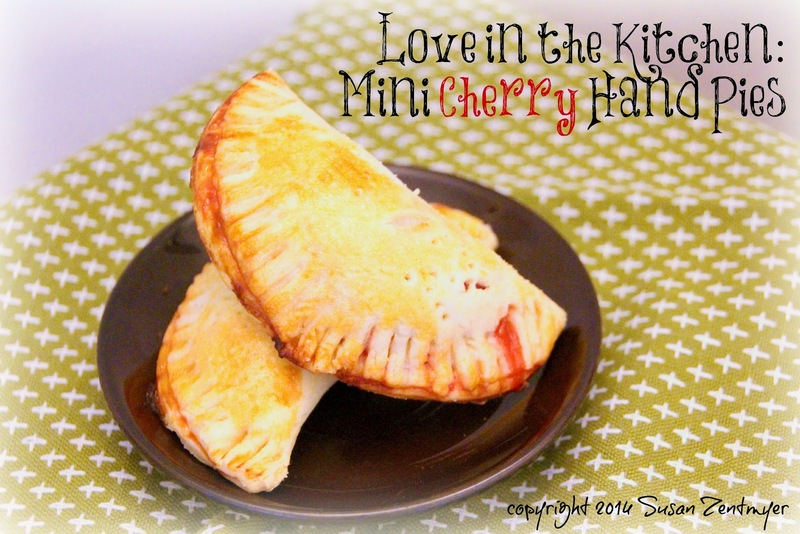 You will, however, get a most delicious cherry hand pie - not too sweet and with the flakiest butter pastry imaginable! Add the flour, sugar and salt to the bowl of a food processor. Pulse to combine. Add the butter and pulse until it forms a sandy crumb. Starting with 4 tablespoons, sprinkle the water over the flour-butter mixture and pulse until it forms a ball, about 45 seconds to 1 minute. Add another tablespoon or two of water if necessary. Dump onto an unfloured counter and form into a flat disc. Wrap in plastic or waxed paper and refrigerate for at least 1 hour. Line two rimmed baking sheets with parchment paper. 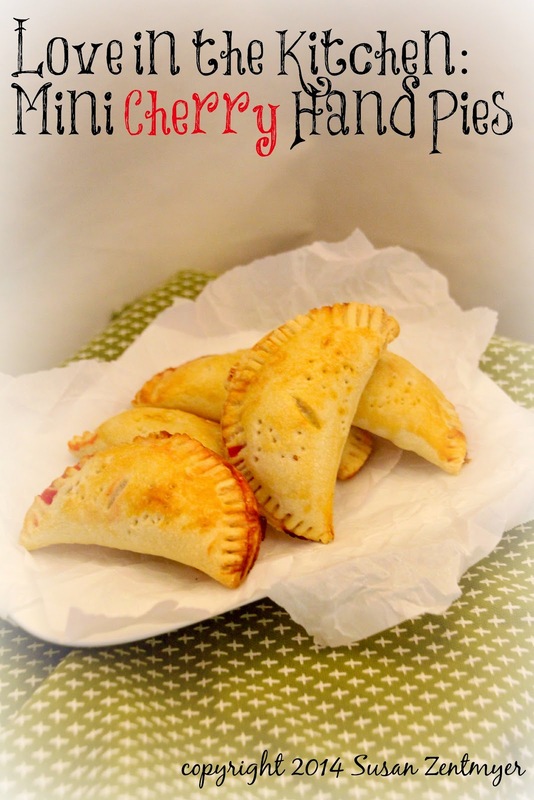 For the filling, combine the cherries, sugar and all purpose flour, or tapioca flour if using, and salt. Stir to mix well and set aside. On a lightly floured surface, roll the dough out to 1/8 to 1/16-inch thick. Place cut circles on the parchment-covered baking sheets. Spoon 1 to 1 1/2 teaspoons of filling into the center of each circle. Fold over, making sure the filling is not spilling out the edges, and crimp the edges with a fork. Pierce tops with a fork to create steam vents. Brush tops with egg wash and sprinkle with coarse sugar, if using. Bake for 15 minutes, until golden. Let sit on sheets for 2 minutes, then transfer to a wire cooling rack. Serve warm or at room temperature. A Chance to Win $650! Tax Day Giveaway! For My Friends - A Spring Break Giveaway! !